The EL3154 analog input terminal processes signals in the range between 4 and 20 mA. The current is digitised to a resolution of 16 bits and is transmitted (electrically isolated) to the higher-level automation device. The input electronics are independent of the supply voltage of the power contacts. 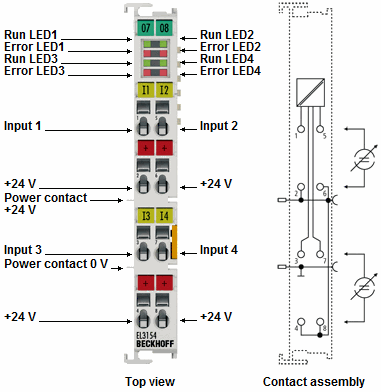 In the EL3154 with four inputs, the 24 V power contact is connected to the terminal in order to enable connection of 2-wire sensors without external supply. The power contacts are connected through. The 0 V power contact is used as reference ground connection for the inputs. The signal state of the EtherCAT Terminal is indicated by light emitting diodes. The error LEDs indicate an overload condition and a broken wire.